Renewable energy sources that reduce our dependence on oil and gas and decrease the emissions of green house gases may unintentionally do more harm than good. In the rush to develop biofuels, forests are burned in Asia to clear land for palm oil, and swaths of the Amazon are stripped of diverse vegetation for soya and sugar plantations for ethanol. The campaign [for sustainable biofuel standards] is driven by evidence that developers in the two Asian countries have burned vast tracks of rain forest to grow palm oil. The fires unleash millions of tons of carbon dioxide and smoke that shroud entire areas of Southeast Asia in eye-watering smog for weeks at a time. The Netherlands is Europe’s biggest importer of palm oil, used in a wide range of supermarket products as well as a fuel oil supplement. One Dutch company has plans [as of 2005] to build three 50 megawatt power stations exclusively running on palm oil. This is part of a hurried effort by The Netherlands to produce biofuels, which is not just an internal environmental decision but a reaction to stringent limits on carbon emissions imposed by the EU and a response to skyrocketing oil prices. To promote the use of biofuels, the Dutch government has created a basket of tax incentives. The government is rethinking the consequences of the push. The Cramer Commission, which conducted the study, has recommended “a track-and-trace system to follow a [sustainably developed] product from plantation to power plant, like an express delivery package”. This may be a good test case for RFIDs. The original goods/packaging could be peppered with the minute ID tags. Enough should survive each step so the provenance of the goods could be determined. Not to say there wouldn’t be problems (e.g., diluting the ‘sustainable’ products with non-sustainable oil) but my experience with certificate programs suggests that they are quite difficult to enforce. Every bit helps. Green cleaning products are the Tupperware of the upper class. The number of extensions being linked to Google Maps/Earth/Etc. is incredible. The coffee-table atlas is virtually obsolete (no pun intended). For example, have you ever wondered where Anseba is located? Visit http://www.maplandia.com/eritrea/anseba/ for all you need to know. Information chips implanted in the brain. Electromagnetic pulse weapons. The middle classes becoming revolutionary, taking on the role of Marx’s proletariat. The population of countries in the Middle East increasing by 132%, while Europe’s drops as fertility falls. “Flashmobs” – groups rapidly mobilised by criminal gangs or terrorists groups. Among the environmental problems they cite are water scarcity and climate change. All in all, it’s not too cheery. Santa Clara County, California has just decided to limit its sale of geographically related information, that is the data needed to make computerized maps. The stated reason is homeland security because “they didn’t want some of the data to end up in the hands of terrorists”. However, the county also just happens to be in the final phase of a lawsuit alleging that the county overcharges for its data. According to the report, the county currently charges $150,000 but a consultant hired BY the county asserts that the whole data set could cost as little as $22,000. This is a completely made-up argument thrown in at the last minute,” he said, noting that the county had already sold the information and that employees without any kind of special training are allowed to work with it. In the killer app world of Google Earth and Google Maps, this type of data now forms a critical part of standard government operating procedure. For example, private sector planners use it to assess the impacts of transportation proposals. Realtors use the data to sell homes. Corporations use it to select sites for new development. Availability of local spatial data possesses enormous importance as a window onto government activties, whether it’s police presense, environmental impacts, or affordable housing construction. That’s why the San Jose Mercury News is one of the plaintiffs and why nonprofit and environmental organizations should follow this case closely. Environment Canada has just approved a Swedish toilet for use in Canada. 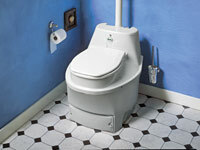 The Multoa, imported from Sweden, is a waterless composting toilet. More on the toilet from EcoEthic. Update: If you need computational power, then try the eToilet, a joint venture between Microsoft and Mulltoa. Or if you require more efficient processing power, then I’d suggest the Mulltoa NE, which allows for batch composting. The Google TiSP. Another in a long line (here, here, and here for most recent) of our toilet-related posts. You are currently browsing the Computers, Society, and Nature blog archives for April, 2007.